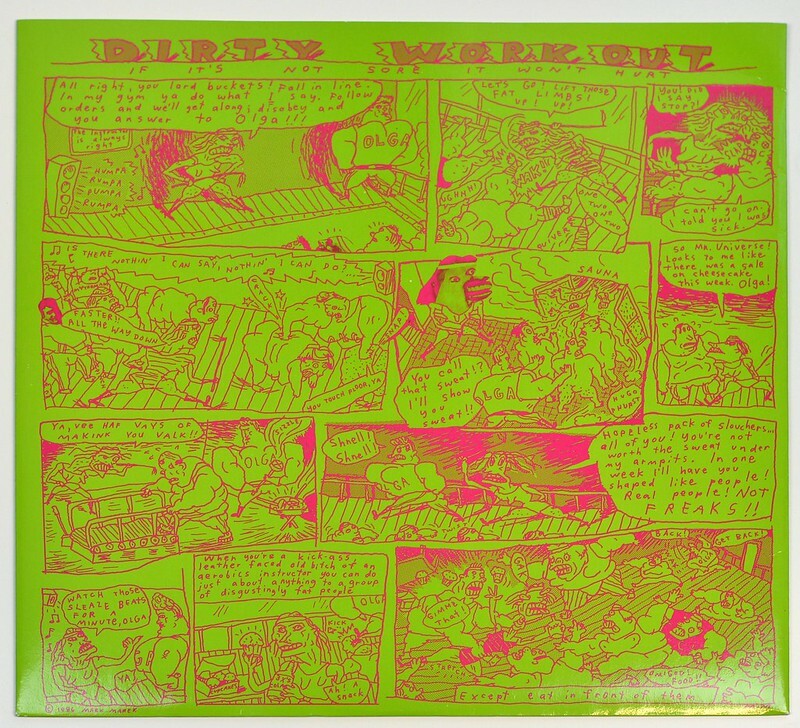 "Dirty Work" is the 18th full-length official album by the British Rock band "The Rolling Stones", it was produced by "Steve Lillywhite" and released in 1986. This album is still in the (opened) dark red cellophane shrink-wrap. 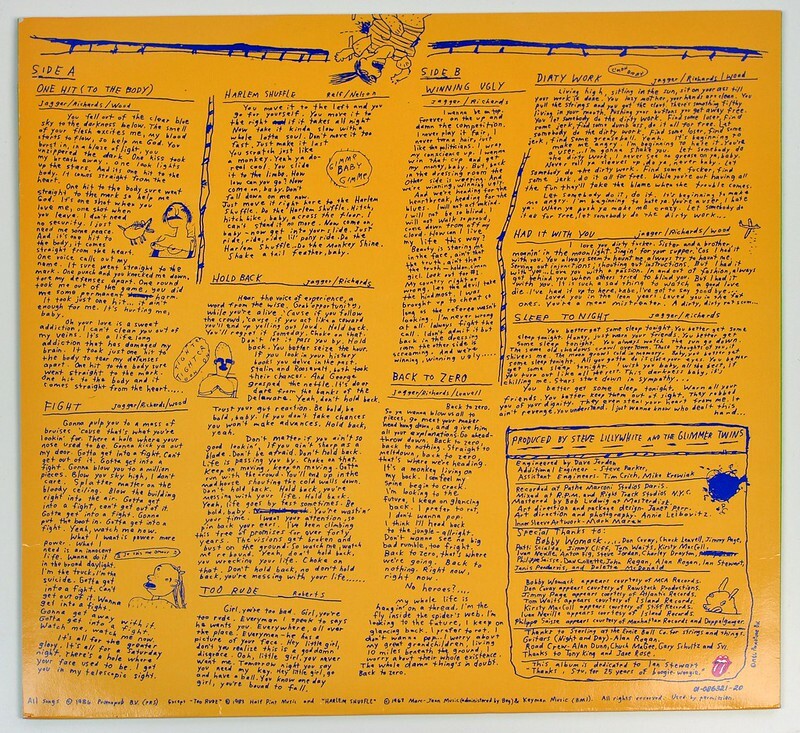 The inner sleeve contains the complete lyrics of all the songs and a comic strip, drawn by Mark Marek. Vinyl: Mint (M) - Absolutely perfect in every way. Looks never been played. Cover: Mint (M) - Absolutely perfect in every way. Looks never been handled. 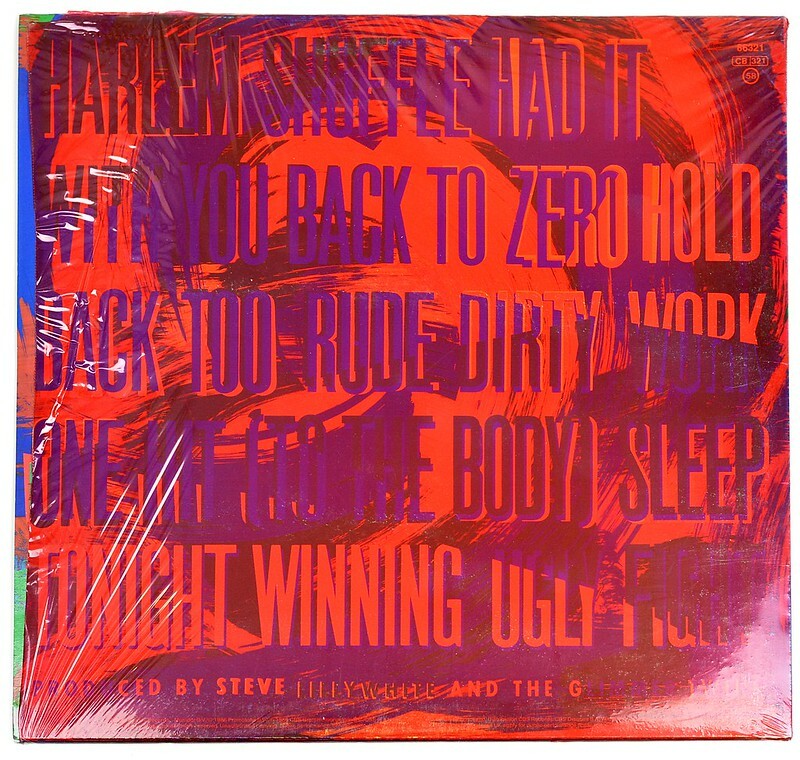 This album comes in the original dark red cellophane shrink-wrap and has the large illustrated promotional sticker on the front. 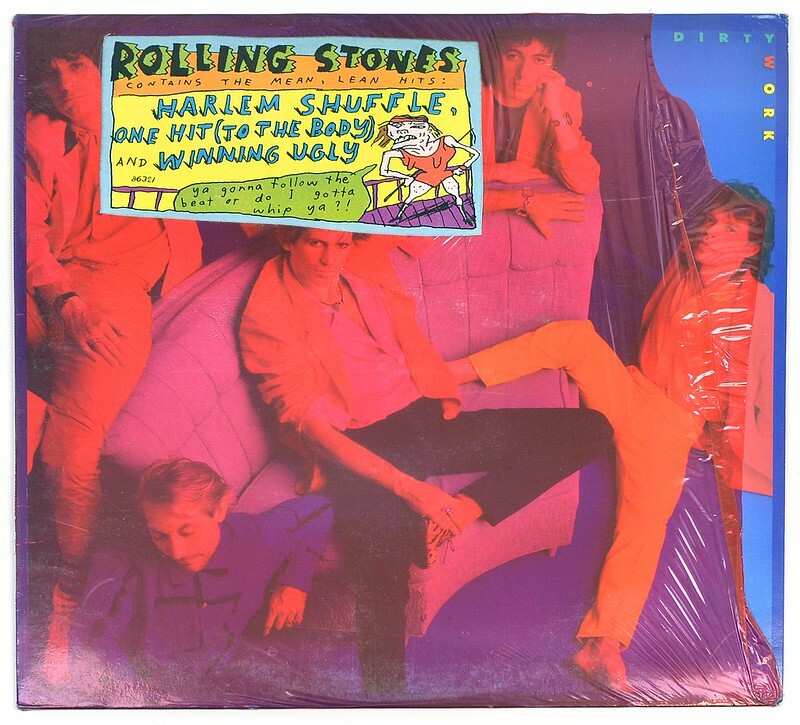 The name of "The Rolling Stones" does not appear on the cover. The is NO barcode on the album back-cover. The catalognr "86321" is printed on the top right corner of the album0s back cover. 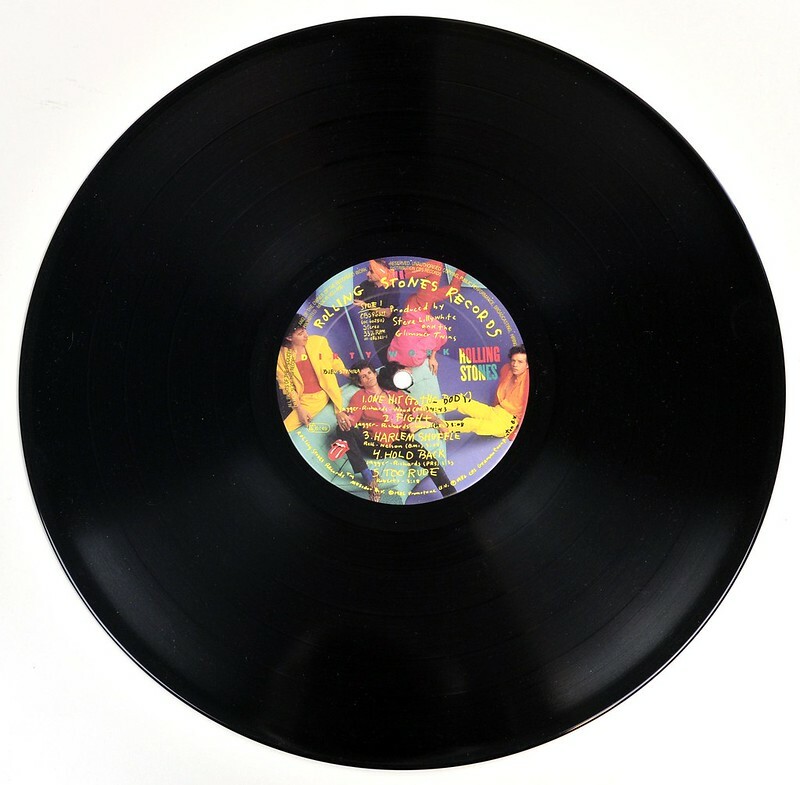 The labels have colourful artwork with photos of the Rolling Stones. High Resolution and Quality Photos of Complete Album Covers "ROLLING STONES Dirty Work"
Click on the images below and use the zoom-buttons to enlarge the images and reveal more details of the cover photos. 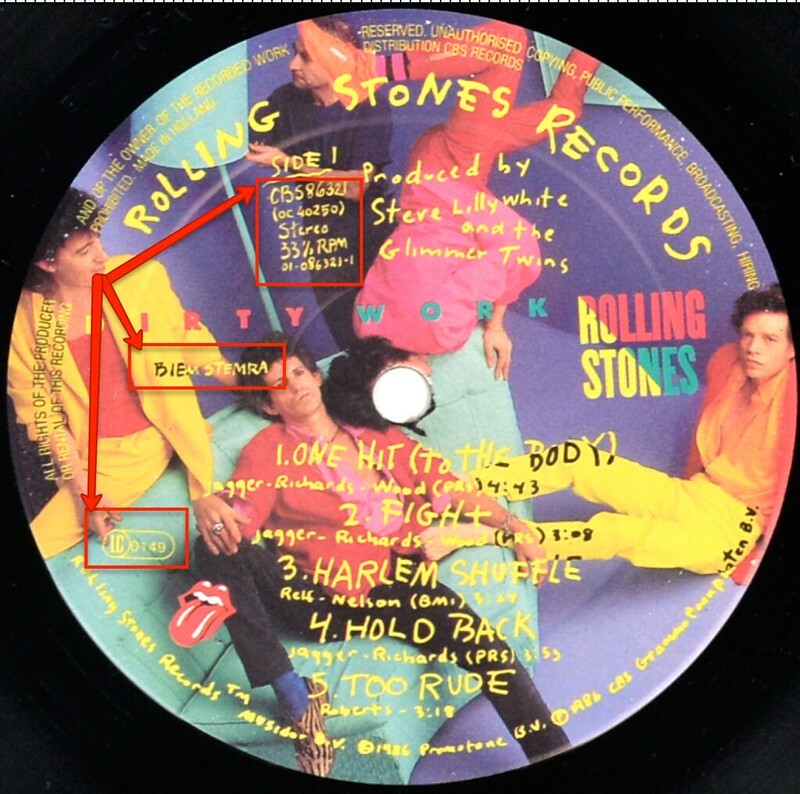 Album Back Cover Photo of "ROLLING STONES Dirty Work"
Using the marked/"highlighted" rectangles below , you will be able to correctly identify this release of the album. Keith Richards – Electric And Acoustic Guitars, Piano, Backing Vocals; Lead Vocals On "Too Rude" And "Sleep Tonight"
Ronnie Wood – Electric, Acoustic And Pedal Steel Guitar, Tenor Saxophone, Backing Vocals; Drums On "Sleep Tonight"
Jimmy Page – Electric Guitar On "One Hit (To The Body)"
Bobby Womack – Backing Vocals, Electric Guitar On "Back To Zero"
John Regan (Ace Frehley) – Bass Guitar On "Winning Ugly"
Complete Track-listing of the album "ROLLING STONES Dirty Work"